Van Gerwen had smashed Taylor's previous world record with a 123.40 average against Michael Smith in Aberdeen a week ago, and treated a 4,500 sell-out at the Westpoint Arena to another master-class. Wright averaged almost 109 in reply, but was limited to just two darts at a double as van Gerwen recorded a ten-dart leg, an 11-darter, three 12-dart finishes and checkouts of 81 on the bull and 100 with two double tops. 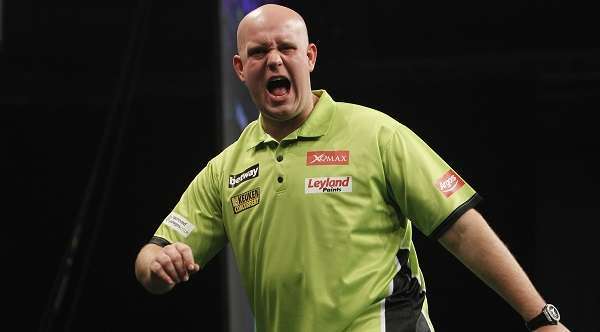 "It was another fantastic performance from myself," said van Gerwen. "I couldn't ask for anything more, to get two points and a good result against Peter because he played well too. "I'm full of confidence and I'm really focused at the moment, and to play as well two times in a row is fantastic. "The hard work has paid off in the last two weeks and I'll try to do even better next week and I hope I can produce another game like this." "I played quite steady darts but I'm delighted to get the two points," said Taylor. "Adrian missed doubles and I took advantage of him, and at 6-1 up I'd got him. "When you see that your opponent's under pressure you've got to keep them under pressure and I did that. "The main thing is qualifying for the Play-Offs in the Premier League and then I can try to push on and win the title back, and I'm pleased to be on eight points." "I'll take the two points any day of the week," admitted Anderson. "I was 3-0 down but probably should have won two of those legs so the pressure was on, but I came good in the end." "It means the world to me to get the win and I can relax now," said Smith. "When I was 5-4 down I had nothing to lose and I wanted to throw everything I could into the final few legs. "All the way through I felt I could win, and when I hit the 180 and 90 finish to go five-all I knew I'd win. I'm not the player to give up and roll over and I never stop fighting. "I'm on three points now and I'm glad I'm not the person sat at the bottom. I know I can beat every player in this Premier League, I've done it before and I can do it again." "I'm really happy to win," said Wade. "I didn't think I played as well as I did - I've played far better than that in some games and lost, so maybe I was due a win like that. "Every match is a massive match but I haven't played how I can for the last two or three games I lost them, and maybe I made a little bit of hard work in this but I got there." The Betway Premier League continues next Thursday at the Motorpoint Arena in Nottingham, which include's van Gerwen's meeting with Chisnall and the master-versus-pupil meeting between Anderson and Smith.